How do we earn the love and commitment of our clients? 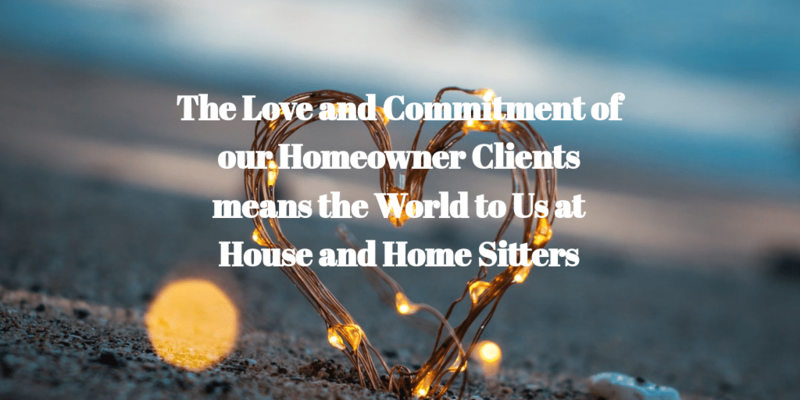 At House and Home Sitters we strive constantly to earn the love and loyalty of our homeowner clients. This is reflected in so many repeat business clients coming back to us over and over again, once they realise how much they can depend on us carrying out our commitments to them, how reliable, friendly, respectful of privacy and caring our professional sitters are, not only in caring for their homes, but also in the level of love and care shown for any pets involved. The connection between our clients’ love for our business and our results is powerful. As many businesses learn to their cost, it’s only when clients love your company that your business thrives. All of us at House and Home Sitters are focussed upon spending time, attention and resources toward building client loyalty. Our entire customer experience is designed to motivate our homeowner clients to become committed to us. Just achieving client satisfaction and meeting client expectations are not enough for a business to succeed in our current environment. We aim continually for Client Commitment. It’s been our secret in driving results both today and well into the future. The best advertisement is when a friend or colleague excitedly tells you about a company with which they love doing business. We feel our strongest achievement in the success of our company has been the ever-growing number of clients demonstrating this kind of commitment to us, to which our excellent reviews, not only on our website but also on independent review sites like Trustpilot and Google, also bear testimony. A committed client happily gives us a significant share of their love, loyalty and support and is willing to bypass our competitors to do business with us instead. Committed clients stick with us for the long-term and go out of their way to tell others how great it is to work with us. In summary, committed clients love doing business with us, seek our input and advice; they communicate and share with us. They see us as more than just a service, and they’ve stopped comparing us to the competition, because they care about their relationship with your us, having found this is reciprocal. We appreciate our many clients – and our sitters – who are so deeply committed to us.